If you only have a little time in Las Vegas, maximizing the visit to see the best spots in the city should be the top priority. 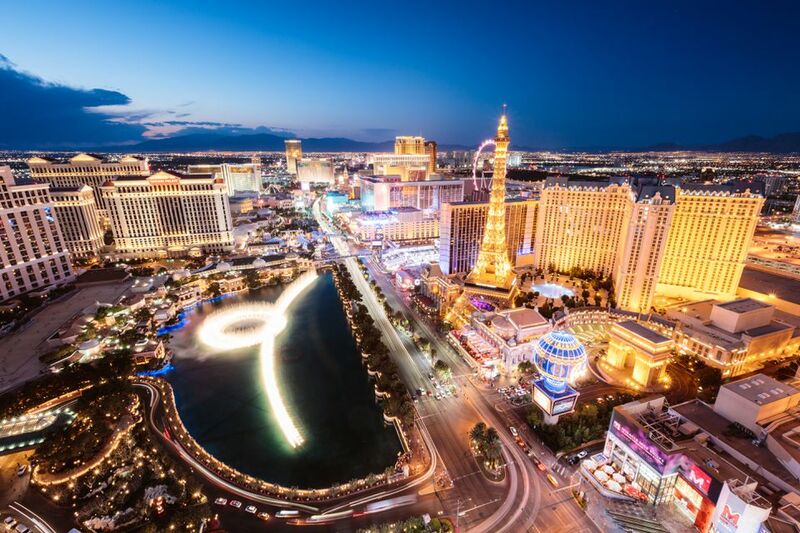 As Sin City hotels and resorts are like small cities, it's easy to get overwhelmed by the options so choose your itinerary carefully when in a time crunch on the Las Vegas strip. Michael Jackson One by Cirque du Soleil is the standout offering by the entertainment group, which has a number of different shows performing in the city at any one time. While the music of Michael Jackson is the draw, it's the acrobatic dance set to the collection of MJ's biggest hits that's the real showstopper. Few leave MJ ONE at Mandalay Bay without a smile on their face. Sure, it is easy to put a roller coaster like the Manhattan Express on a list of must-do things if it was the only thrill ride around but it’s not. It's simply the best one of them all. Anyone who enjoys the flush of excitement as a coaster drops you off a ledge and then spins you upside down won't leave disappointed. Board inside the New York-New York Hotel and Casino and the track takes riders outside the building to witness fabulous views of the Las Vegas strip and the Vegas Valley before the bone-shaking ride zips around the front of the resort. At L'Atelier de Joel Robuchon, diners won't only get a quality meal but a culinary arts performance. This award-winning gem of a dining spot at the MGM Grand is not a show kitchen where a volcano of onions will spew smoke. There are no entertainers in this kitchen, only top professionals who labor over every nuance of the dish. This collections of chefs masterfully and artistically put out masterpieces that you get to eat. So, while the food is impressive, you’ll be dazzled by their attention to detail and their work ethic to provide a dining experience that captures both the eyes and the taste buds. The CityCenter Art Collection is an attraction that many visitors walk past but don't stop to truly appreciate. The artists featured in the massive public art project that dot the grounds of the hotel are comparable to what you find in National Mall in Washington D.C. and showcases visual work from world-famous artists like Maya Lin, Claes Oldenburg, Coosje van Bruggen, and more. The best feature: The experience is totally free. Stop into the Aria Resort and ask the concierge for a walking tour pamphlet for a self-guided tour. There are many bars to spend time at in the Cosmopolitan Resort but the Vesper Bar stands out because the staff handles each cocktail with the precision and required care that should be paid to a good drink. Grab a seat at the modern bar that will satiate the craving to gaze upon over-the-top Vegas glitz and glamour as the pros behind the bar offer signature libations based on classic recipes like an Old Fashioned or Dry Gin Martini. If hunger strikes after sipping on a few drinks, the food offerings from the supper club at Rose. Rabbit. Lie. are just a few steps away. While the Bellagio has a ton of appealing bars, the reason to pay a visit to the Lily Bar and Lounge is that patrons to can grab a seat in this upscale lounge without needing to pay for the table. It's fairly rare to find a high-end bar in Las Vegas where you can get treated as a high-roller without having a massive bankroll, but this 3,393-square-foot drink hall offers dozens of cozy ottomans to sink into with no bottle service requirement. The unparalleled view of the casino floor from the panoramic windows is perfect to people watch while relaxing a world away from the hustle of the Strip in a cozy, refined setting that won't break the bank. At the Eiffel Tower at Paris Las Vegas, visitors actually get two attractions for one as views from the Tower also include the spectacular water show at the Fountains of Bellagio. Head over at dusk to soak in the sunset as part of the 360-degree views on the 46th-floor observation deck of the exact half-scale replica of the French iconic structure. Roaming ambassadors are always on hand to answer any questions on the landmarks that are spread out below, while the locale is known as the most romantic spot in town. As the name implies, Absinthe at Caesars Palace aims to intoxicate adult audiences by immersing them into the world of 19th-century burlesque. There isn't a bad seat in the house to catch the live performers dancing, singing and completing wonderous feats of acrobatic prowess thanks to the circular stage providing no location that is more than 11 rows from the action. The carnival-themed show is continually awarded top marks from critics for its mix of comedy and sultriness but be warned that the subject matter is strictly for adults only that enjoy a bit of bawdy in their evening entertainment. If you want a spot where the party is happening all the time, then you want a spot at the bar at Margaritaville inside the Flamingo Las Vegas. You don’t have to be a Jimmy Buffet fan to have a good time, but this spot might convert you. Parrot Heads (as fans of Buffet's music are known) are fun and chatty people. Step up to the bar order something blended and take in the atmosphere. It’s as if you are on a boat in a warm bay somewhere down south and you really have nowhere to go. Take the ride on the LINQ's High Roller, a huge observation wheel that allows for a view of all of Las Vegas from 550 feet above the strip. Take the 30-minute ride right before sunset to soak in the natural (and unnatural) light show. The Beatle’s LOVE is arguably the best show in Las Vegas thanks to high octane performances set to the three-time Grammy Award-winning score of the music from the Fab Four. The show features classic tunes like Yesterday, All You Need is Love, and Twist & Shout but attendees don’t have to know the music to be impressed by the twisting, twirling acrobatics that the Cirque du Soleil troupe puts on twice a night. It is hard to beat the Canyon Ranch Spa at Venetian Las Vegas for a spot to discover a new level of relaxation while getting a full body massage. The Aquavana environments offer the option to soothe skin, mind, and body with water environments ranging from super cool to humid and moist. The fitness center is huge and the diverse fitness classes they offer are plentiful. Toss in a climbing wall and an entire component devoted to foot therapy and you can stay all day. Parasol Down is a hidden gem of a bar that whisks patrons away from the crowds and noise of Sin City. The stunning lounge features a 40-foot waterfall cascading down past a hyper-realistic mountain scenery over a live water show on the Lake of Dreams. The entrance to the bar requires a journey through the sister bar, Parasol Up, and down a winding escalator to emerge into an oasis where the sun shines on the patio seating. The observant staff is always close at hand to serve up another round of perfectly crafted cocktails. Losing at the Blackjack table isn't the only option to get the pulse pumping inside the Circus Circus. El Loco at Adventuredome is within an indoor, climate-controlled theme park that offers a variety of fast-paced rides. The coaster slowly climbs to 90 feet high before dropping passengers up, over and under the track to experience a 1.5 vertical-G ride at speeds up to 45 miles per hour. Guest will feel a sense of “cool” when walking into The Sayers Club at SLS Las Vegas. It’s different than a typical club on the Strip and more akin to a blend of upscale mini-concert hall, lounge, and living room. The small venue features an outdoor patio that offers an intimate location to see acts like headline comedians, live sports and musicians in a comfortable, cozy, yet elegant setting with a modern chic twist. Does the idea of stepping out onto a platform 829 feet above the Strip and jumping off seem crazy? If not, the Sky Jump at Stratosphere Las Vegas is for you. The controlled free-fall experience holds the Guinness World Record as the highest commercial decelerator descent facility in the world and allows daredevils to plummet at 40 miles an hour down into the padded zone at the bottom. Think of it as a vertical zip line. For those that just want to cheer on the jumpers, a viewing platform gives a great vantage point without the high anxiety. Rides are offered throughout the day and at night, so jumpers can take decide the best time to see Vegas from the most unique vantage point in town.